Microsoft Corporation Chairman Bill Gates advised Congress to reform both the United States education system and immigration policies during a hearing yesterday honoring the 50th anniversary of the House Committee on Science and Technology. 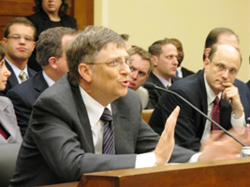 Microsoft Corporation Chairman Bill Gates advised Congress to reform both the United States education system and immigration policies during a hearing yesterday honoring the 50th anniversary of the House Committee on Science and Technology. “I believe this country stands at a crossroads,” he said, adding that if these issues are not addressed, then innovation, the engine of economic progress in the United States, will shift to other nations that are more committed to technological excellence, costing the country many high-paying jobs. The United States faces a shortfall of scientists and engineers who can help develop tomorrow’s promising technology he warned, citing the National Science Board’s Science and Engineering Indicators 2008 report, which found a fifteen percent decrease in the number of science and engineering undergraduate degrees awarded between 1985 and 2005, with the numbers showing little signs of improvement in recent years. With statistics projecting two million job openings in science, technology, engineering, and mathematics-related fields by 2014, the decline in students pursuing STEM-related careers could stifle innovation and economic growth, he said. One reason for the decline, Gates said, is STEM education in high school, which fails to prepare students for the rigors of science and math at the college level. On math and science tests given to high school students among the industrialized world, U.S. students scored near the bottom. The problem may be the lack of qualified STEM teachers. Chairman Bart Gordon (D-TN) pointed out that 63 percent of math teachers and 93 percent of physics teachers in public schools have no certification or degree in the field. Gates called for the design of new metrics to both measure the progress of students as well as to identify effective STEM teachers so as to codify their methods and help other teachers implement the successful techniques in their classrooms. When questioned about how to alleviate the shortage of science and math teachers in U.S. schools, he suggested increasing wages for teachers in STEM education. Gates also suggested creating science and technology-themed schools as a possible way to improve education and spark student interest in science and math. The Bill and Melinda Gates Foundation funds the creation of such schools and helps other schools incorporate STEM projects into the curriculum to improve education. Gates also addressed U.S. immigration policy, stating that current Federal approaches hurt the U.S. by keeping top talent out of the country and driving down job creation. Foreign students now comprise 60 percent of graduate school students in science and engineering programs. Gates told committee members to make it easier for those foreign students to stay in the U.S. after they finish their studies. He argued that the Federal government, which pours money into basic research in these programs, is essentially subsiding the education of foreign students and then losing their talent when they cannot stay in the country after graduating. The economy also suffers, he said, claiming that for each H1-B visa (a temporary U.S. employment visa) hire Microsoft makes, an average of four additional employees are added to support them. He said other technology companies have similar experiences, making it all the more important to allow top talent to stay in the country. Rep. Phil Gingrey (R-GA) questioned Gates’s stance, saying that allowing more H1-B students into the country will increase competition, deterring U.S. students from studying science and engineering. Gates countered, saying that U.S. students will have to compete either way since companies will open offices abroad, forced to go where the talent is. He compared the new globalized atmosphere of competition to the Olympics, were Americans will have to compete with the best from other countries in the job market. He advised Congress to increase the visa cap, streamline the path to permanent resident status, and do away with per-country limits. Microsoft Corporation Chairman Bill Gates advised Congress to reform both the United States education system and immigration policies during a hearing yesterday honoring the 50th anniversary of the House Committee on Science and Technology. "I believe this country stands at a crossroads," he said, adding that if these issues are not addressed, then innovation, the engine of economic progress in the United States, will shift to other nations that are more committed to technological excellence, costing the country many high-paying jobs. The United States faces a shortfall of scientists and engineers who can help develop tomorrow's promising technology he warned, citing the National Science Board's Science and Engineering Indicators 2008 report, which found a fifteen percent decrease in the number of science and engineering undergraduate degrees awarded between 1985 and 2005, with the numbers showing little signs of improvement in recent years. With statistics projecting two million job openings in science, technology, engineering, and mathematics-related fields by 2014, the decline in students pursuing STEM-related careers could stifle innovation and economic growth, he said. One reason for the decline, Gates said, is STEM education in high school, which fails to prepare students for the rigors of science and math at the college level. On math and science tests given to high school students among the industrialized world, U.S. students scored near the bottom. The problem may be the lack of qualified STEM teachers. Chairman Bart Gordon (D-TN) pointed out that 63 percent of math teachers and 93 percent of physics teachers in public schools have no certification or degree in the field. Gates called for the design of new metrics to both measure the progress of students as well as to identify effective STEM teachers so as to codify their methods and help other teachers implement the successful techniques in their classrooms. When questioned about how to alleviate the shortage of science and math teachers in U.S. schools, he suggested increasing wages for teachers in STEM education. Gates also suggested creating science and technology-themed schools as a possible way to improve education and spark student interest in science and math. The Bill and Melinda Gates Foundation funds the creation of such schools and helps other schools incorporate STEM projects into the curriculum to improve education. Many of the committee members were curious to know how to motivate students to study science and math, citing the space race and moon landing as events that inspired a generation of Americans to take up careers in science and engineering. Gates said that the fields of artificial intelligence, opportunities to fight devastating diseases, and the hope of striking it rich were just a few modern day motivators, but that it mostly fell to teachers to bring the subject to life. Rep. Vernon Elhers (R-MI), a nuclear physicists and strong advocate of science education, said at the hearing that he offers this advice to high school students: "You have a choice, be a nerd, or work for a nerd." Gates also addressed U.S. immigration policy, stating that current Federal approaches hurt the U.S. by keeping top talent out of the country and driving down job creation. Foreign students now comprise 60 percent of graduate school students in science and engineering programs. Gates told committee members to make it easier for those foreign students to stay in the U.S. after they finish their studies. He argued that the Federal government, which pours money into basic research in these programs, is essentially subsiding the education of foreign students and then losing their talent when they cannot stay in the country after graduating. The economy also suffers, he said, claiming that for each H1-B visa (a temporary U.S. employment visa) hire Microsoft makes, an average of four additional employees are added to support them. He said other technology companies have similar experiences, making it all the more important to allow top talent to stay in the country. Rep. Phil Gingrey (R-GA) questioned Gates's stance, saying that allowing more H1-B students into the country will increase competition, deterring U.S. students from studying science and engineering. Gates countered, saying that U.S. students will have to compete either way since companies will open offices abroad, forced to go where the talent is. He compared the new globalized atmosphere of competition to the Olympics, were Americans will have to compete with the best from other countries in the job market. He advised Congress to increase the visa cap, streamline the path to permanent resident status, and do away with per-country limits.